Happy first day of autumn! Or, at least the calendar says it’s the first day of autumn. The weather is a perfect sunny and 75° with a lovely breeze today. Autumn? 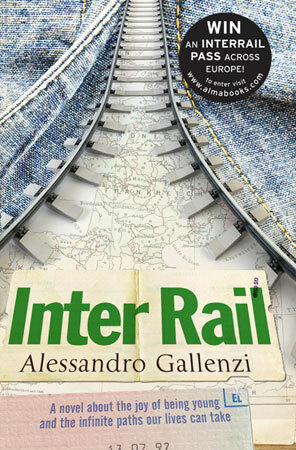 Well, not quite yet on the Amalfi Coast. September is often one of the most pleasant months of the year, with weather still warm enough to enjoy the beach and cool enough to actually enjoy the beach. But I do have autumn on the mind since I love the colors and watching the seasons change. 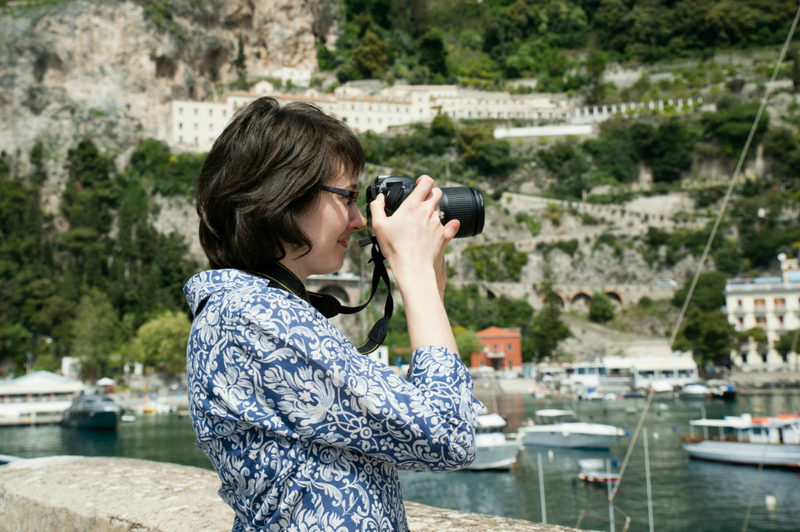 Last year I shared photographs of autumn colors in Ravello and an autumn walk in Scala. 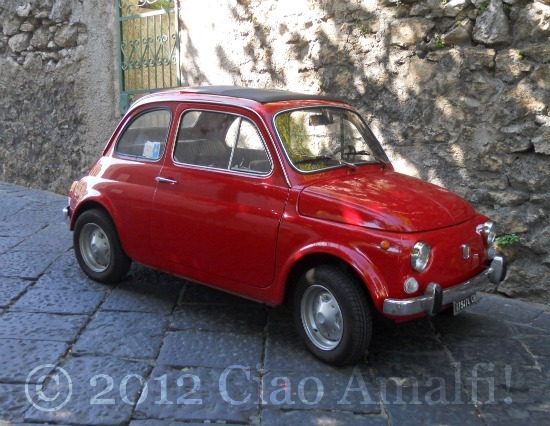 Since I can’t do much yet with autumn colors, this lovely red vintage Fiat 500 will just have to do. That’s an autumn color, right? I walked around a corner in Scala yesterday morning and this little beauty was caught between the sun and shade of the sycamore trees. Not a leaf on the ground … not yet at least! Happy autumn from the Amalfi Coast! 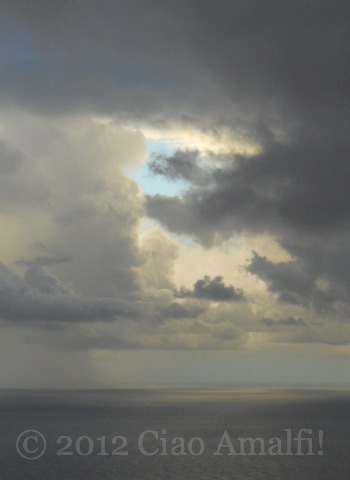 September arrived with a surprise this year – cooler temperatures, stormy skies and rain rain rain. While it is mildly perplexing just where summer had to get off to in such a hurry, the record heat and dry spell we’ve had this year means no one is complaining about the sudden weather change. (Although we do secretly hope summer will come back for a little bit longer so we can enjoy the beaches without the crowds!) This morning I awoke to low rumbling, and I couldn’t tell right away if it was coming from up in the mountains or out at sea. Wrapping a robe around my shoulders against the cool breeze, I looked out to see it was coming from both directions. Nature was putting on a spectacular show, with the colors of sunrise filtering through and highlighting layers of storm clouds. It was dark and warm, intense and uplifting – all at the same time! If I could paint this is what I would paint – that little bit of blue coming through the dark clouds, the orange light of sunrise hanging on for as long as it can, the texture of the clouds, the calm sea. I might add a wooden-masted sailing ship out there, but that would be over the top. I think I’d better stick with photography. 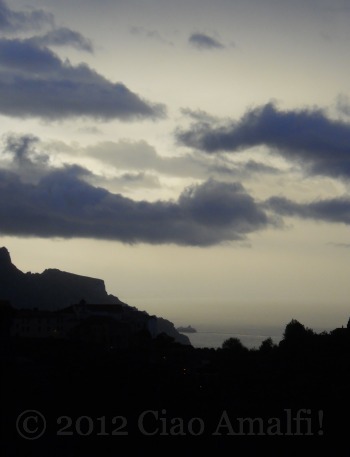 Off in the distance I could see a small cruise boat hurrying into the port of Salerno and street lights dotted along the walkways in Ravello against the dark morning sky. 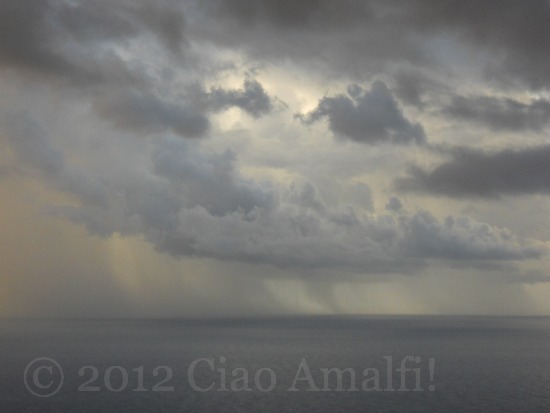 I hoped for a break in the rain for all the travelers visiting the Amalfi Coast today. 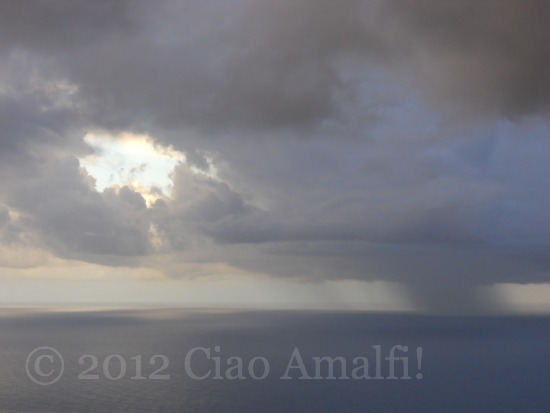 And then said a moment of thanks for waking up to another beautiful morning sky on the Amalfi Coast.